What’s the weather like in Las Vegas? Who knows?! 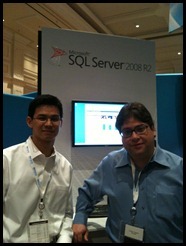 The place to be is inside the Bellagio Hotel and Casino where the SQL Server Magazine conference is taking place. The Microsoft booth has seen a steady stream of traffic and a question that keeps coming up is “when is SQL Server 2008 R2 being launched?” Pretty great that people are excited! If your schedule didn’t permit you to attend this event, you can watch the interviews with the SQL Server team at the DevConnections website.